As a first time mother, I remember being absolutely overwhelmed with how truly hard and time-consuming it was to take care of a baby! Though I have never loved anyone more than my precious son Mark, being a new mom was a major challenge for me. He never slept through the night, and when he had middle ear infections, he’d wake up every 45-60 minutes crying. I’d often be up 6-8 times a night. When we finally were able to get tubes into his ears, life became much better! Before I had Mark, as a speech-language pathologist, I’d give all these complicated suggestions to parents for stimulating their children’s speech and language development. Now I am much more realistic, and want to share some easy, practical, successful, research-based strategies that even the most tired, busy caregivers can easily work into their daily routine. No money or big chunks of time needed! √ Read to your child every day. I read to Mark daily from the day he was born. Use books with bright, colorful pictures and not very many words per page. When Mark was a toddler and so very active, we would literally read books to him during meal time. That was the only time he would sit still! Babies are most attentive to books right after they wake up from a nap. Many infants and young children love to be read to sleep. 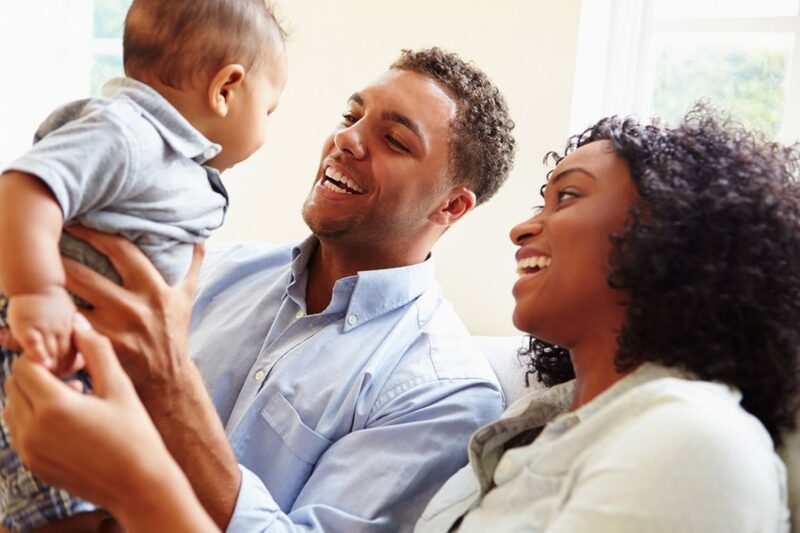 √ Put a safe glass mirror in your child’s crib. Point out and label her body parts. 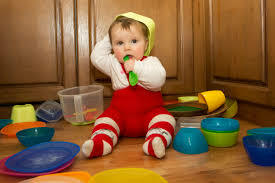 √ Give children chances to put objects in and out of containers, line them up, and move them around while talking about what is going on. You can use boxes, margarine containers, and other simple household items. We’d let Mark play with these things on the kitchen floor while we fixed dinner. √ Start a scrapbook made of sturdy paper. You can take and print pictures, pasting them into the scrapbook and letting your child look at them often. You and your child can talk about the pictures. Print the word under each picture so your child learns early print awareness skills. Obviously, little ones won’t read the words, but exposure to print is good for them. √ Remember to smile at and laugh with your child! They read us so intuitively and well; if we are angry, tense, or bored, they will pick it right up. Enjoy your precious little one before she starts asking for the car keys—the years go fast!